BigChange provides a paperless way to plan, manage, schedule and track any mobile workforce with a seamless solution for managing the entire operation from quote all the way through to invoice. As a 5-in-one Mobile Workforce Management platform, it combines a customer booking app, cloud-based back-office CRM and job scheduling, a rich mobile app for the driver or engineer combined with real-time vehicle tracking – easy and intuitive to use, customise and implement. A fundamental component to the BigChange platform is its ability to communicate in real-time, sending and receiving mission-critical data securely. This is achieved through Wireless Logic’s private infrastructure overlay across the cellular networks, delivering a tailored 3G/4G solution for BigChange mobile devices UK-wide. The deal signed between both organisations will see a shared commitment to roll out an additional 40,000 subscriptions with an expected turnover in excess of £40m by 2020. Today, clients include HSS Tool Hire, Silentnight Beds, Morrison Utility Services and Sheffield City Council. 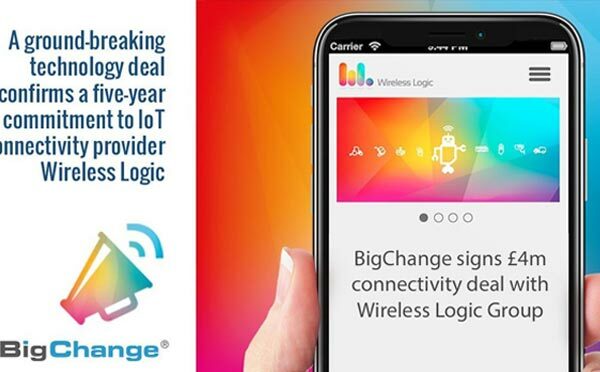 Europe’s leading independent M2M (Machine to Machine) and IoT (Internet of Things) platform provider, Wireless Logic Group works with thousands of application providers, systems integrators and enterprises delivering a portfolio of services including tailored management platforms, private network infrastructure and specialist mobile, satellite, fixed line and low power wireless area network (LPWAN) connectivity. All services are supported by a team of multi-disciplined personnel including technology development, consultancy and client management. Founded in 1999 by CEO Oliver Tucker and CSO Philip Cole, Wireless Logic is backed by CVC Capital Partners (www.cvc.com). The organisation’s European headquarters are located in Hurley, Berkshire UK with country offices in Denmark, France, Germany and Spain. BigChange by name, BigChange by nature! BigChange is an established force in mobile workforce management, offering a system that transforms the way companies manage their mobile operations. JobWatch from BigChange is the paperless way to plan, manage, schedule and track any mobile workforce. This powerful all-in-one Mobile Workforce Management platform combines back office software, mobile apps, fleet management and real-time vehicle tracking in one simple to use system. Using JobWatch, customers can manage their entire operation, from quote all the way through to invoice.